Microsoft’s foldable device project codenamed Andromeda has been delayed, as per a report that emerged earlier this month. Despite the talks of internal uncertainty around this upcoming device, Microsoft has gone ahead and patented technology that will allow for “three-way video calling on hinged multi-screen device” which is also the title of the patent filed by the Redmond, Washington giant in its home country. 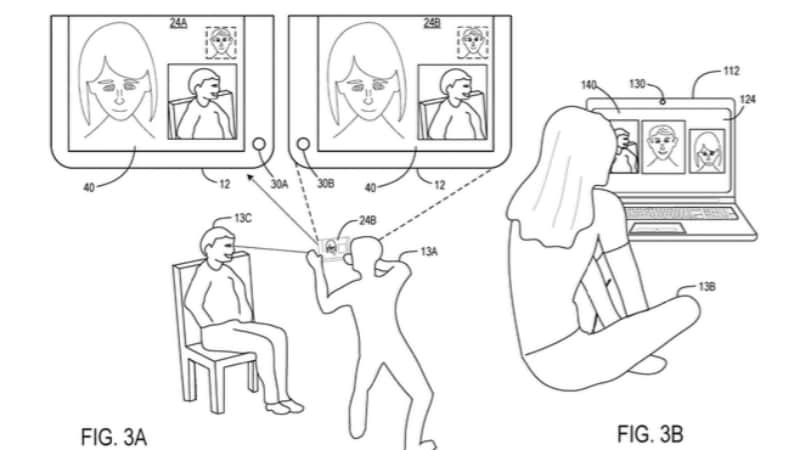 As per the diagrams shown in the filed patent, the user might be able to broadcast two streams from this single Microsoft device during a video call. From the Abstract section in the patent numbered US10015442 (via Windows Latest), this mobile computing device will include a processor, an accelerometer, and a housing consisting of two parts. Both the parts will include a display and a camera module each. As per the diagram, the device will be able to simultaneously stream from both cameras, one of which will be a front-facing setup and the other pointed towards the rear of the device. The patent was issued on July 3, 2018. The patent notes that this design language will address the issues of fitting in more participants in the video call by giving the camera an orientation that is practical for such a situation. “Conventionally, it may be difficult for users in the same physical space to be part of a video call when they are not in proximity to one another, especially when there are three or more participants,” it states. To recall, back in November last year, Apple had patented a similar design allegedly for a foldable iPhone variant. The patent showed off a similar hinged design that is expected to allow the device to be folded like a clamshell mobile phone. Apple may begin production of the foldable iPhone in 2020. Much before that development, Samsung has been known to patent foldable device designs of which a finished product is yet to be seen. However, Samsung Mobile chief DJ Koh says that the result will come to market in the second half of this year.